The U.S. inflation-linked bond (TIPS) market is in an interesting position right now. Inflation protection seems cheap, but the question always remains: is it cheap for a reason? Unfortunately, I am not able to answer that question, I am going to just briefly outline the debate. 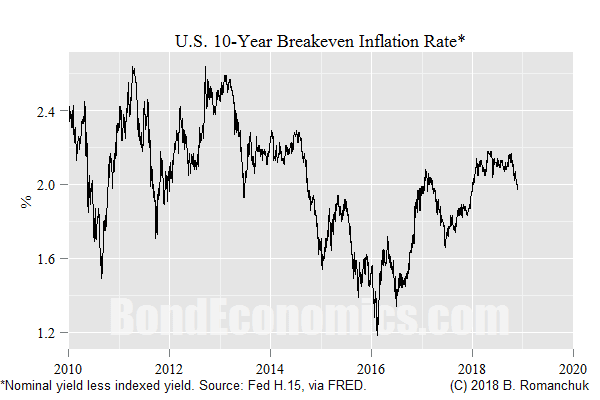 The chart above shows the 10-year (simple) inflation breakeven, which is calculated by subtracting the quoted yield on a 10-year TIPS (the "real yield") from the conventional 10-year Treasury nominal yield. We can see that the breakeven has dipped below 2%, but it is well above the 2016 lows. My recently released book (although still waiting on paperback) Breakeven Inflation Analysis offers a comprehensive intermediate level analysis of the properties on breakeven inflation rates. One of the recurrent themes within the book is the importance of oil prices for breakeven inflation. Most economists normally focus on core measures of inflation (inflation rates excluding food and energy), but the return on TIPS is based on all items (headline) CPI inflation. Recent developments in the oil markets help explain the dip in breakeven inflation. Oil prices are certainly not conforming to the usual pattern of firming during an expansion (figure above). This will certainly have a mechanical dampening effect on headline inflation. We are in the midst of a long expansion, albeit a rather sluggish one. If the U.S. economy can dodge a serious recession, inflationary pressures should eventually be showing up sooner or later. 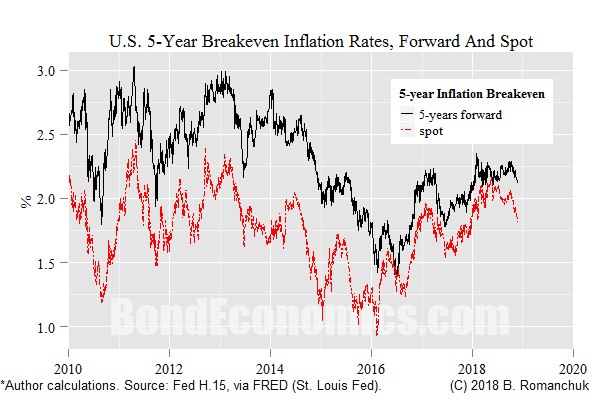 From this perspective, forward inflation rates are not incorporating any form of risk premium against higher inflation. Given the need of an ageing population to hedge inflation risks in retirement, this obviously makes the levels of forward breakeven inflation interesting. Unfortunately, there is also a simple explanation for the current situation. 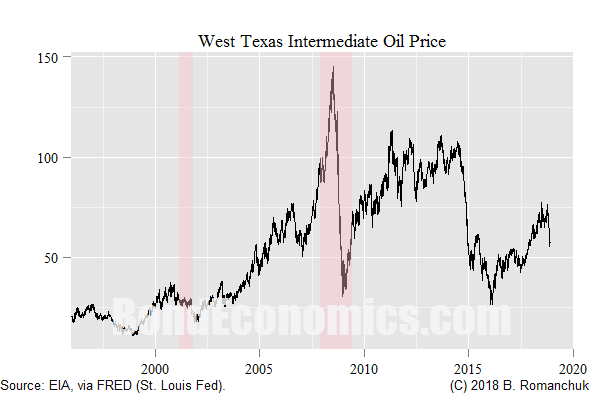 A number of risk asset markets are under some strain (such as the oil market), and one could argue that the United States is "due for a recession." (I do not put great weight on theories that suggest recessions happen at regular intervals due to "wave dynamics," but it is still a popular theory.) A recession coupled with a slow, weak recovery could easily lead to inflation being well below where the Fed says it wants inflation to be five years from now. Finally, have a good Grey Cup Sunday!